We discover Saturday that the backsplash glass is repaired — and grouted. 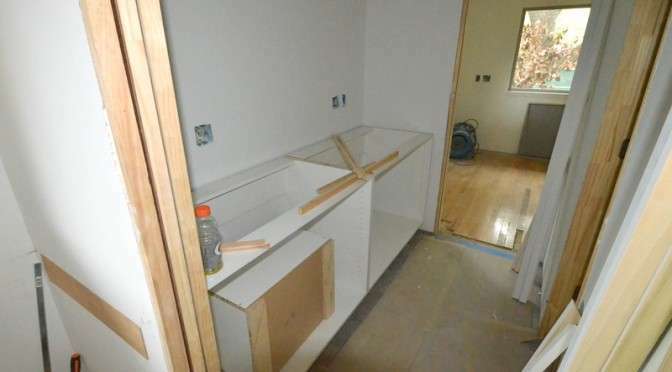 But … to date, there are two issues on this remodel where Jacquela has chosen to object — the tile floor in the master shower, where the grout lines do not align with the walls; and the aluminum drip pans under the tankless water heaters. Today, she lodges complaint #3. First,  I would have thought that the person doing the tile work would have covered the cooktop before working on the tile. I am really upset. My cooktop is a mess. I don't know if there is damage,  or if all of the residue can be removed without further damage. I don't understand why the cooktop was not protected. Now,  the grout at the back/sides of the cooktop is messy and needs to me corrected. Here’s the glass top of the induction cooktop and the red glass backsplash. 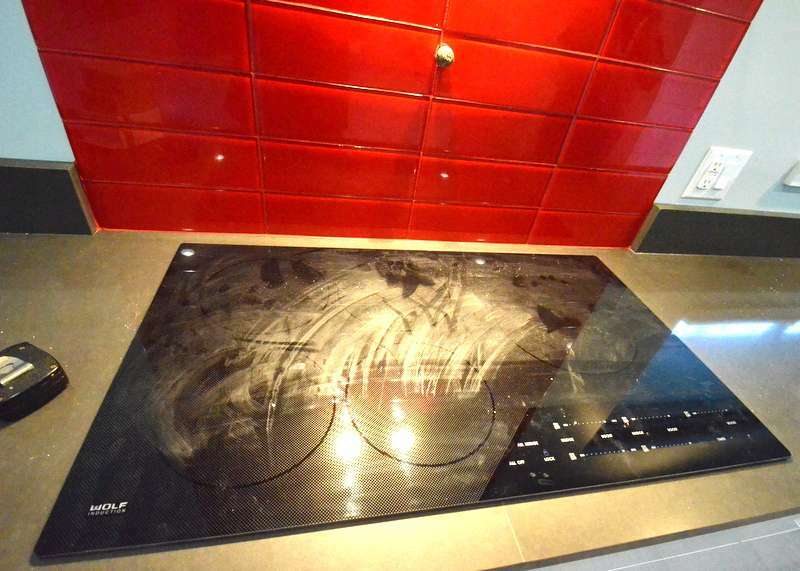 The cooktop glass, clearly, was not protected when the backsplash was grouted. It is caked — albeit lightly — with what appears to be white grout powder that was mixed with water and left to air dry. There should have been a plastic sheet over the cooktop to prevent this. 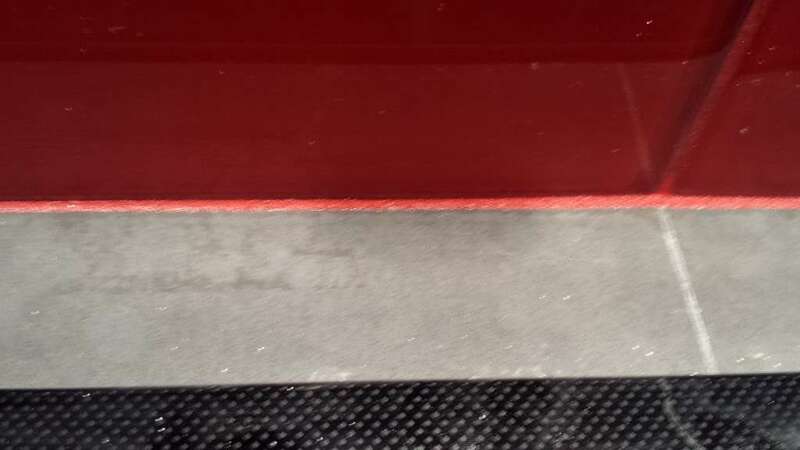 Same shot as above, this time with white lines imposed to identify the second issue — how the backsplash was grouted with red grout, where. Jacquela took this photo of the left corner of grout job. The grout is not crisp, it spills like an alluvial plain onto the countertop and up the quartz backsplash. 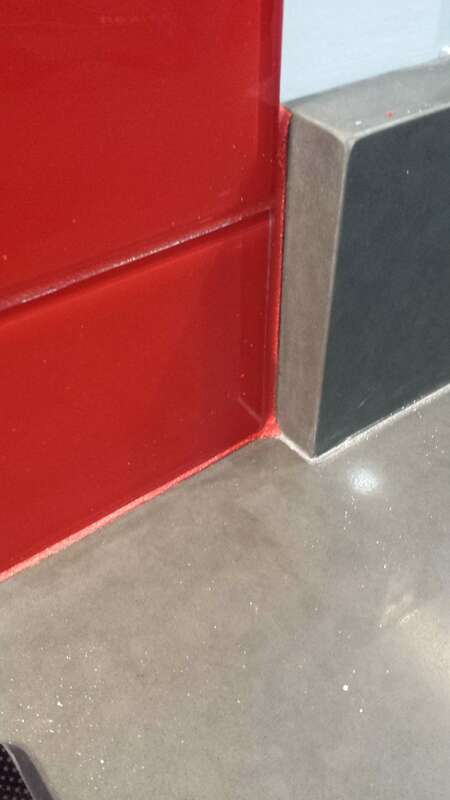 This is the right corner — same alluvial plain of red grout spilling out from the corner –and the red grout “bleeds” up the wall formed by the gray quartz backsplash. 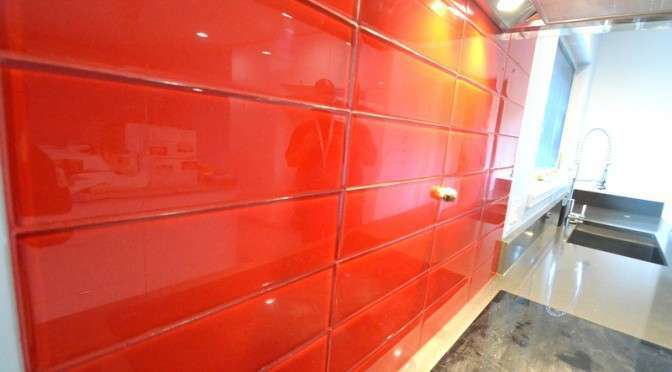 It also bleeds across the junction of the glass tile and countertop. A close up of the “bleed” between the glass-tile backsplash and the gray quartz countertop. 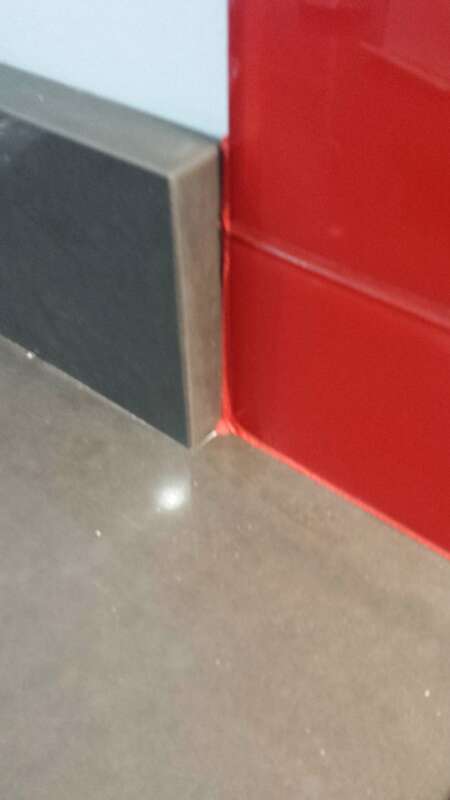 This line should have been caulked with gray silicon, not the red grout. This day began with Odell and Steven in the mudroom bath at 8 am, talking through how to correct issues with the sink drain. We conclude that the P-trap comes off, the drain line in the wall needs to shift x inches left — and, after this surgery is performed, a T-trap will mount perpendicular and plumb correctly under the sink drain. The Time Warner techies arrived about 815 am — first Erich, then Cory, then a team in hard hats to string wire from the telephone poles, then a supervisor. Everyone parked their own trucks, with orange cones. Steven should have charged for parking. They wrapped about 130 pm with TV, phone and, most important, Internet up and running — even WiFi. This milestone enables Steven to work at the house without tethering to his phone. Steven dropped Jadin at school about 845 am. Steve the electrician arrived to install the whole-house and telephone/cable surge suppressors. The whole-house unit was a 15-minute slam dunk on the exterior of the back wall of the garage. Done. The tele/cable suppressor required research, with Steven struggling to learn more electrical science. We convened a conference — Steven, Steve, Erich and Cory — on the driveway, alongside one of the Time Warner trucks. Erich and Cory advised that the tele/cable suppressor is not needed, because the Time Warner equipment comes with suppression/protection built in. Steven decides: He will return the tele/cable suppressor for a refund. The HVAC team arrived from Austin Air to determine how and where to install the make-up air system demanded by the Austin Green Build program. This has to be wired to operate when the exhaust hood in the kitchen switches on — the exhaust system blows out, the make-up air system brings in replacement air. The system requires ducting, and a motor to pull in outside air and blow it into the kitchen. 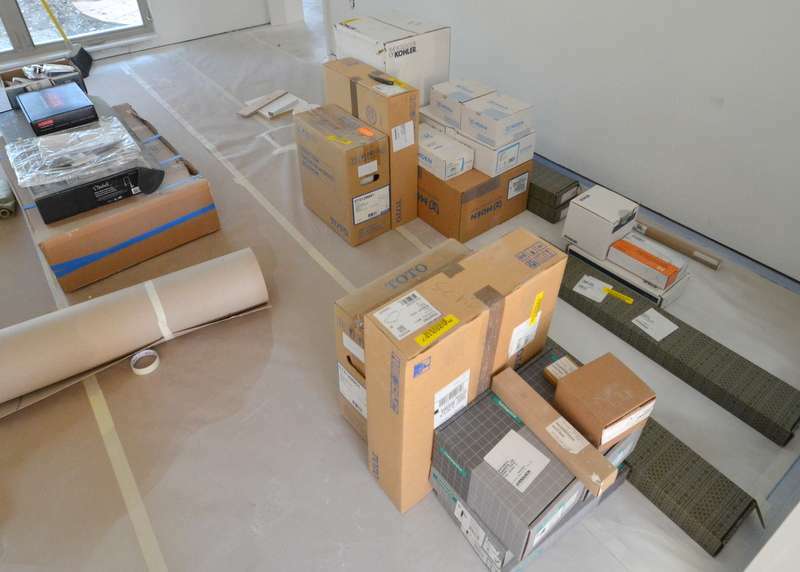 Planning is critical — where to put all of this stuff in a house that is nearly complete? They worked at first with Cris and Odell from Ranserve, then roped Steven into the conversation. Everyone climbed up into the attic over the garage to map out one route into the kitchen. 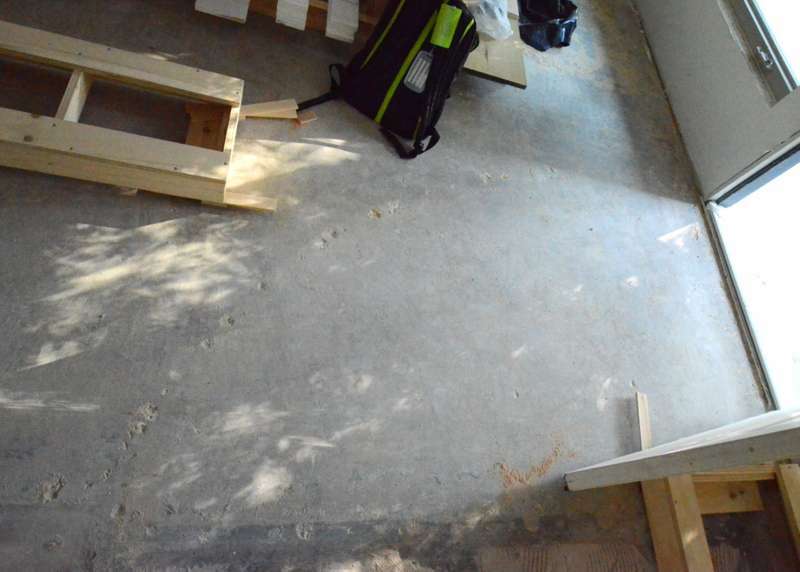 Cris sketched the install on the back of piece of drywall leaning against a garage wall. Then we shifted into the kitchen to look at where the duct might mount — near the kitchen-side door. Then we explored a second option — cutting open the kitchen ceiling to route the motor and duct into the cavity under the roof eaves. This second route would leave a huge grille in the kitchen ceiling visible from everywhere. The better location is over the door. With that decided, Cris cut open a section of mudroom ceiling between the garage and the kitchen — see photo above — to confirm that we can route the duct intake at the eave outside the garage, into the garage attic, connect to the motor when it is installed in the attic, run duct above the mudroom, through the framing between the mudroom and kitchen, to the grille above the kitchen-side door. 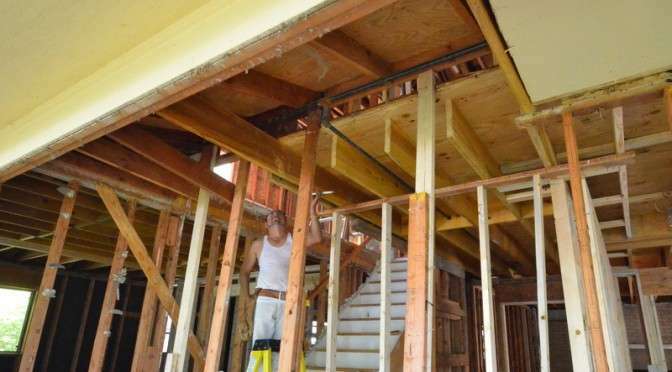 Why was all this not done when the house was gutted down to studs? Brett Grinkmeyer arrived to conduct the architectural inspection required when Ranserve requests a draw payment. Steven and Brett barely got time to speak, because it was time for Time Warner to sit Steven down on the upstairs hall floor, laptop propped on boxes, to configure the network, create a Time Warner customer account complete with passwords, sign off on the install. Victor Martinez arrived to discuss landscaping — using the dirt piled up on the driveway and mulch piled between the trees to fill in around the concrete pavers and spaces made bare of grass by nine months of construction. Steven requests a plan he can submit to Austin Green Build — and a budget. At 2 pm, approximately, Odell returned from an offsite meeting to review the mudroom plumbing — he thinks he has it figured out; it will require opening up a wall to shift the drain pipe to the proper location. And the routing solution for the make-up air system. And the rough plan for the week ahead. Steven called Kristin at Harway to ask why the cooktop does not fit absolutely flush to the quartz countertop. There’s a gap about 1/16th inch between the induction cooktop and the quartz countertop — guaranteed to trap food and spills. Late in the day, Kristin responds by email to report she will visit to inspect. 230 pm — lunch break. Steven comes back from lunch at 3 pm to discover Bassam working on the kitchen cabinets. At 330, Lance from Time Warner calls to close out the install ticket. At 345, Steven departs to pick up Jadin from school. Observation — at several times today, especially in the morning, the questions were firing in, one on top of the other, stacking up over Newark. Each issue required thought and discussion — where to put the tele-cable surge suppressor, for example — it can’t mount outdoors, so why does it mate to the whole-house suppressor that does mount outdoors, is it needed? How to address the drain for the mudroom sink — that took at least an hour, on and off, back and forth, testing ideas, researching options. It was intense. Everything was way above Steven’s pay grade — he’s not a plumber, not an electrician, not an HVAC installer, not a cable tech, not a cabinetmaker, not a landscaper. Steven misses Ron, who seemed able to work through any stress, calmly, expertly, guiding with advice. In his first 48 hours on the job, Odell is quickly coming up to speed. But, damn, we have not had a day like this in a long time — not since Steven and Ron climbed into the 120-degree attic to unravel the botched HVAC ducting. Early start to walk the house with Ron Dahlke from Ranserve, prepping for the week ahead and closing out this week. Above, with temps in the high 30s, Ernesto works in short sleeves, building out the forms for the walk along the side of the house to the kitchen door, then turning 90 degrees to pace out to the driveway. Concrete for these pads is scheduled for the week of 28 December. Ron and Steven inventoried the bathroom and kitchen fixtures. Master bath at 6, mudroom bath at 3, Jadin’s bath and bath 3 at 12, and kitchen at 9. Ron and Steven tested alternate-sized strike plates. 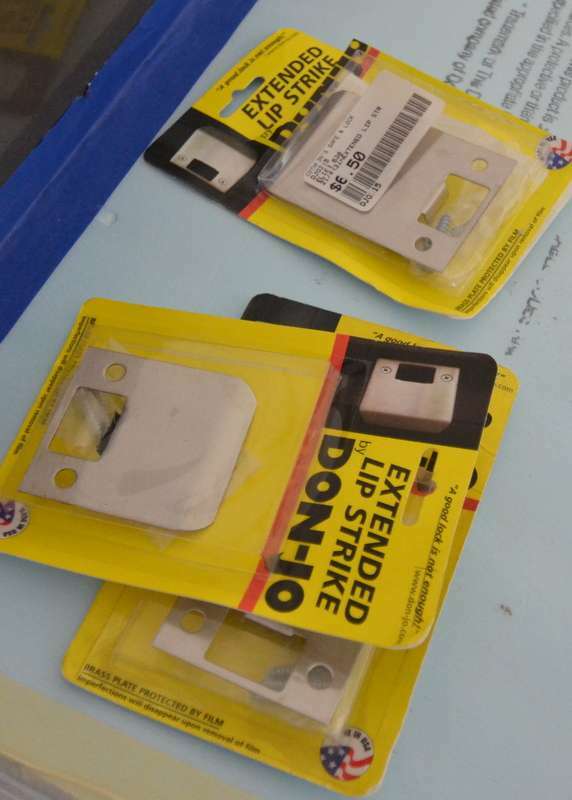 The deep casing around each door means we need extended strike plates — otherwise the latch will wear against the wood. This is an example of how small decisions cascade — the deeper casing triggers more thought. 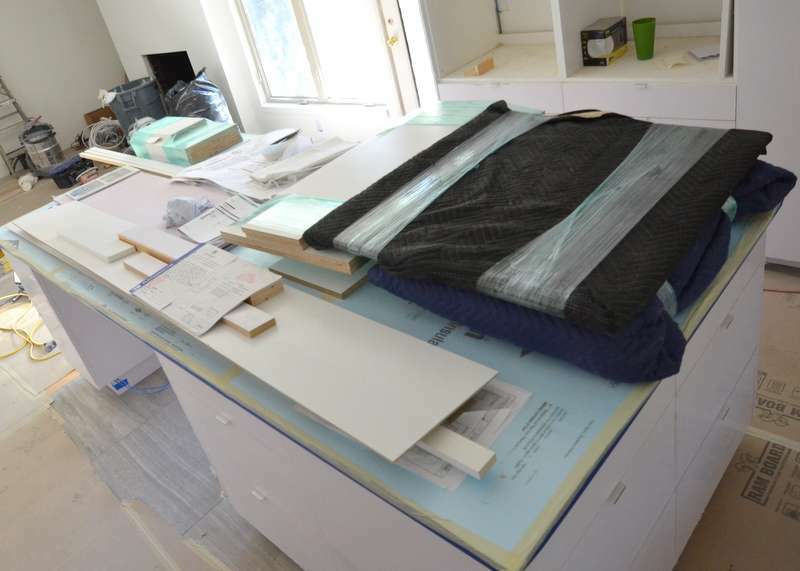 Central Texas Custom Cabinets delivered more shelves and doors for the kitchen cabinets — and Bassam is back to continue installation — now that the painters have taken down the protective plastic sheeting. Above — delivered earlier this week, the base cabinets have been moved into the pantry hallway for installation. Peter installs the skirt board along the stairs. Barry came by today and has a plan for adjusting the plumbing drains for the bathroom cabinets. Once the trim guys complete this first phase, I’ll get Julian back to finish tile issues. Saturday update: Tracy reports the fans will arrive 10 or 11 November and "everything else is here and ready to go." Steven met with Kathleen this morning to begin work on the forms that must be submitted to qualify for the Austin Energy Green Building Program. This will require extensive documentation. Stay tuned. Steven also met at Emerald Hill with Jonathan Hiebert from Push Pull Open Close to finalize selections for the front door handles and the pocket-door hardware. Jonathan promises to finalize the quote and message that to Kathleen for formal submital to and approval by Steven and Jacquela. Work at Emerald Hill today was called off on account of torrential rains — something like six inches since midnight. In the interim, Steven approved change order 17, the most expensive LED on the planet. When the drywall went up on the ceiling in the kitchen, Steven discovered that the three 4-inch ceiling cans for lights above the island were not equidistant from each other. Details here. The bill for this misadventure is $309. That recess trim supplied by others? Steven purchased the 4-inch LED at Lowe’s, on sale, two for $19.98. Let’s do the math — each LED cost less than $11, including tax. Electrical, drywall and labor account for the balance of the $195. In retrospect, back when Jacquela and Steven selected lighting fixtures, one of the options we considered was a linear LED three, four, five or six feet long. That would have required one electrical connection instead of four, and no need to discover just how out of whack the framing is. We should have also hung plumb bobs to verify the distance between each recessed can before the drywall went up, verifying locations against the planned island that the three original recessed cans, now four, are supposed to illuminate. And a FLIR thermal/imaging camera to see through the drywall to structure would have also helped. Early start to a busy day. 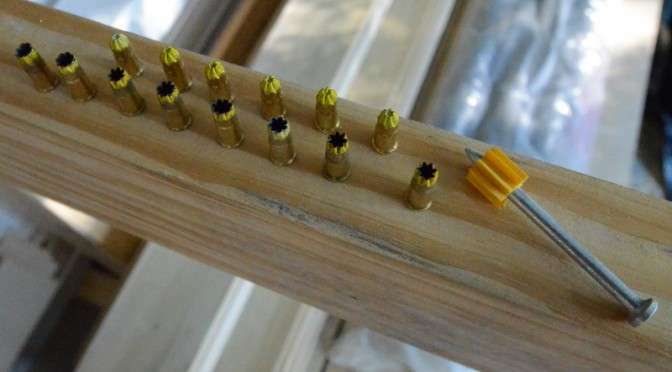 Above, Steven swept up and collected these “bullets” left behind by Basem as he installed the platforms for the kitchen cabinets. The empty shells have been fired. 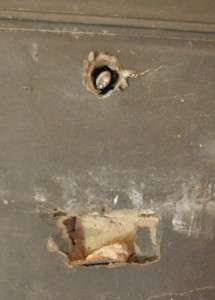 The shells with tips are still “live ammo” capable of driving the pin nail at right into the concrete slab when hammered with a nail gun. We will not be leaving these lying around. Steven arrived at Emerald Hill at 825 am after dropping Jadin off at school. 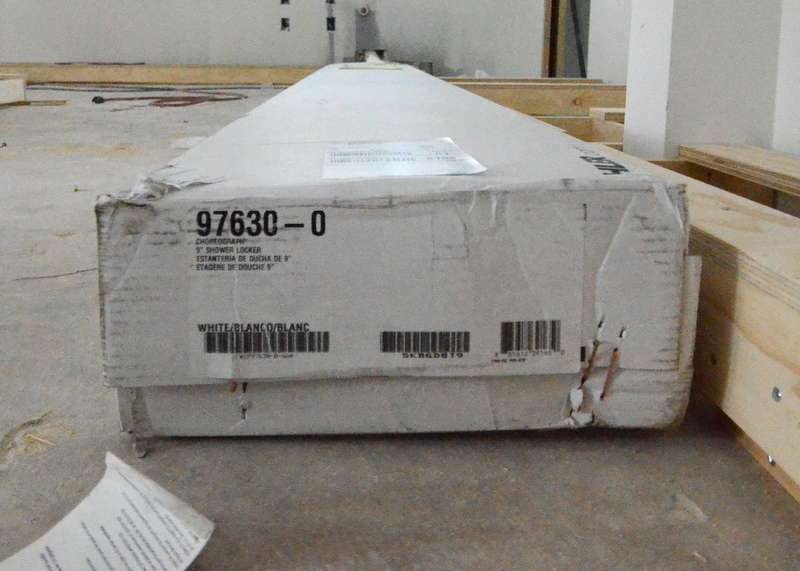 Delivery truck from Ferguson was waiting, with the final missing piece of the shower for bath 2 — Jadin’s bath — the shelf unit that fits into the corner of the shower. Now Ron can finish installing that shower. Steven continued experimenting with tile layouts. 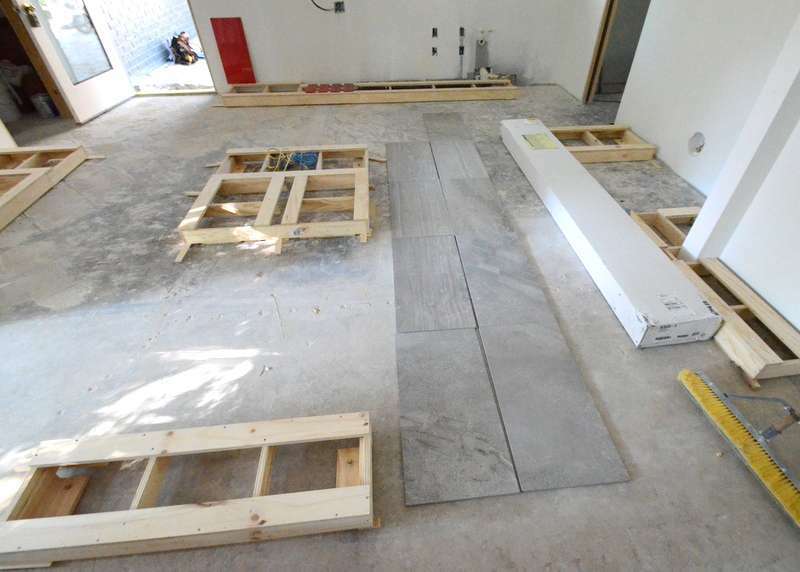 Here is how Jacquela wants the tiles aligned in the kitchen — north/south. Steven approves. And here is how we will lay out the grid of tiles in bath 2 — east/west. Julian and his crew of tile setters arrived about 9 am. Steven walked the tile patterns and layouts with Julian. One open question is — there are apparently two distinct designs in the tile selected for the kitchen floor. One is linear. The other is mottled. 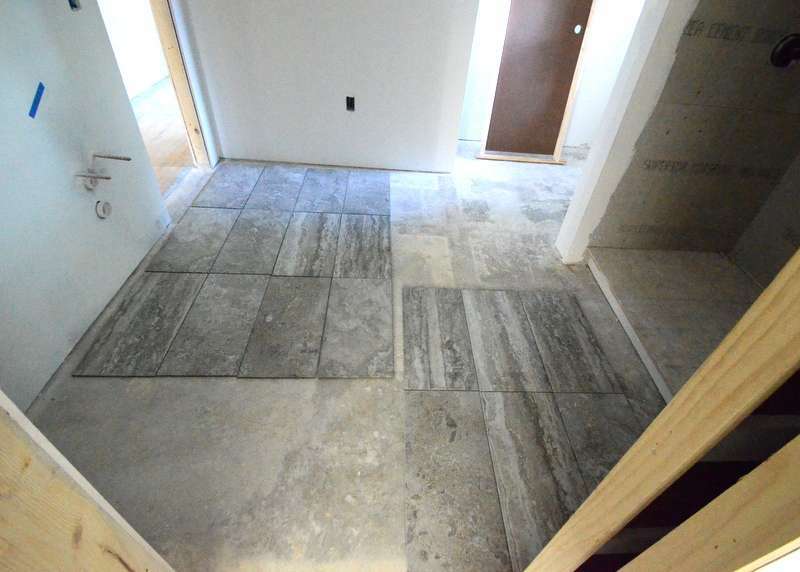 Steven hopes there is enough linear to cover the kitchen floor, and enough mottled to use in the mudroom, mudroom bath and pantry — to help delineate the spaces. We won’t know until Julian opens all the boxes. Kyle from Cowart arrived about 930 to teach Steven about garage doors. We might be able to save and refurbish the existing door, at several hundred dollars. But it still needs a new motor and remote — Steven is holding out for wi-fi and Internet access to the garage door controls. Kyle reports this can all be packaged with a new door, with full warranty, for about $1,000, total. Steven and Jacquela will continue this conversation Saturday when we meet with Kamla. 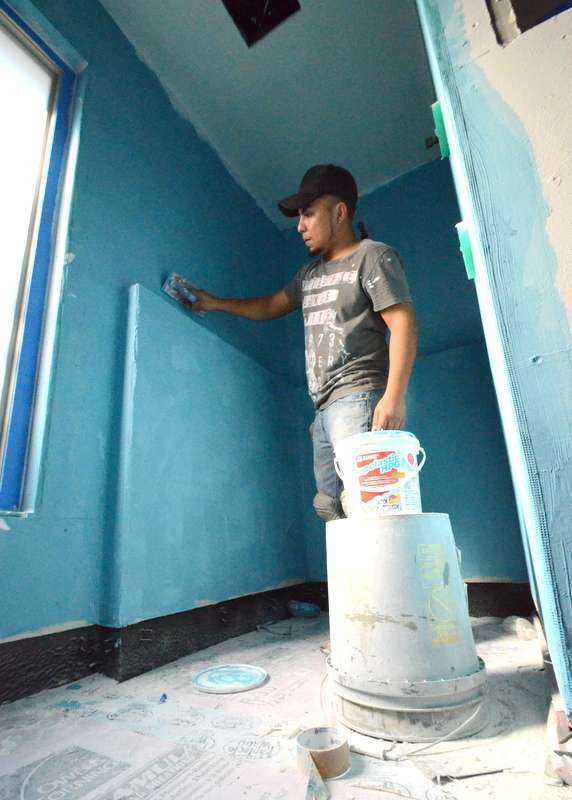 Upstairs in the master shower, Pedro applies a second layer of blue waterproofing to the Hardie board. 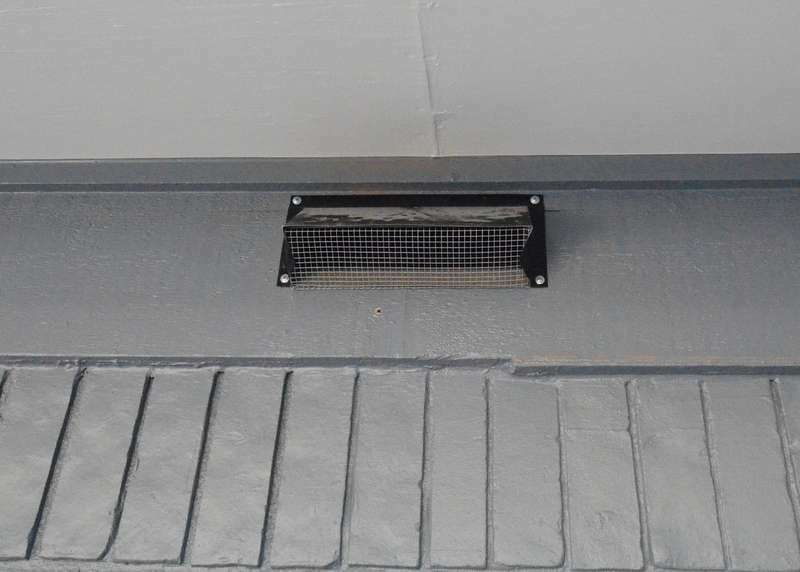 A day or two back, Ron and Cris installed this screen mesh across the exterior of the exhaust vent — to keep critters and bugs out. More history uncovered and discovered. At some point, the family room at Emerald Hill was carpeted — and an arc of some other flooring was installed at the back door. 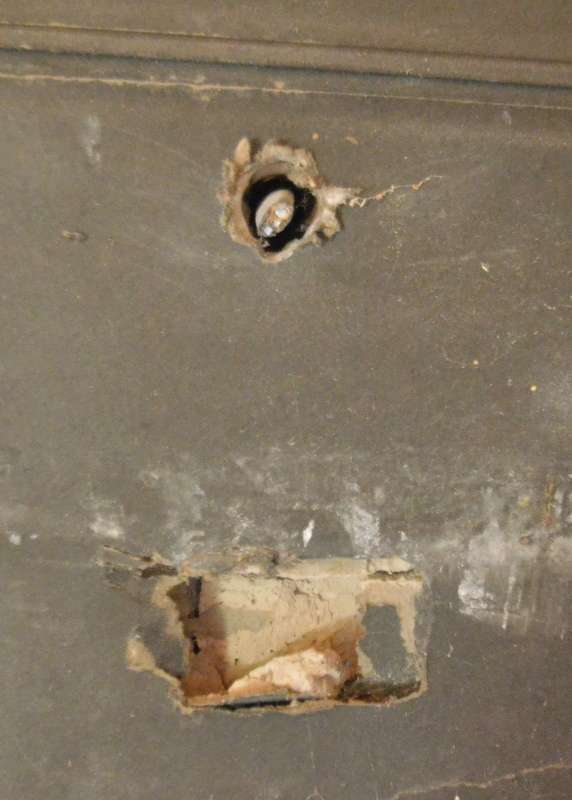 Look closely at the gray concrete for the clefts hollowed out in the slab by the nails in the carpet tack. So how did Christopher Columbus “discover” America if Native Americans already lived across North, Central and South America, in civilizations thousands of years old? Ron Dahlke and Steven took inventory of the doors delivered by BMC West. We believe half the order is still to come. Ron and Steve triple-checked the count of passage, privacy, dummy and pocket door handles; Steven can now order the handles. Steven scheduled a meeting for Tuesday with Victor Martinez to talk about cutting off sprinklers where the garage extension will be built, and installing a new sprinkler control system — when it’s time. It will soon be time. Ron met with the roofer, who reports we will need to vent the garage roof with either a “mushroom” or a ridge vent as part of the garage construction. There is already one mushroom vent, but the enlarged space will need more ventilation. Luckily, we have three mushrooms stored on the driveway waiting for donation to Habitat. More details to come. 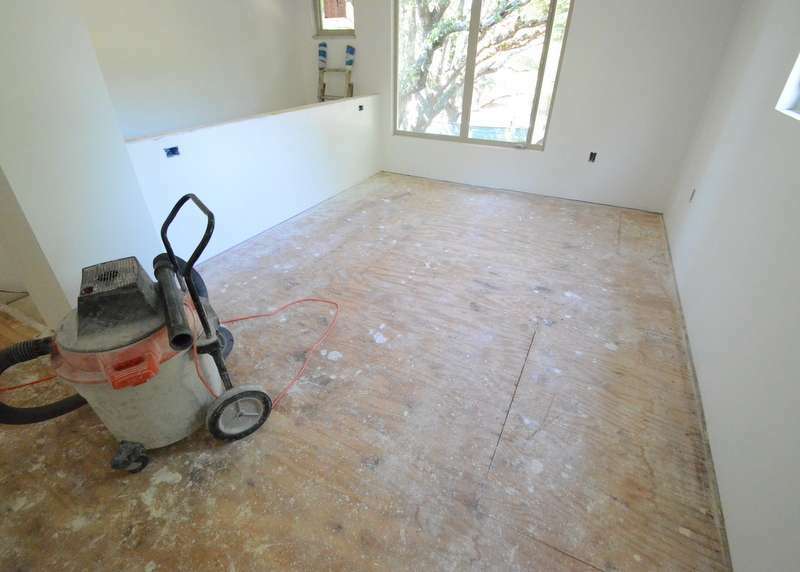 Kevin Rehberg continued to chip out the existing oak flooring, which cannot be saved. Ron reports that the kitchen cabinets might arrive as soon as next week! 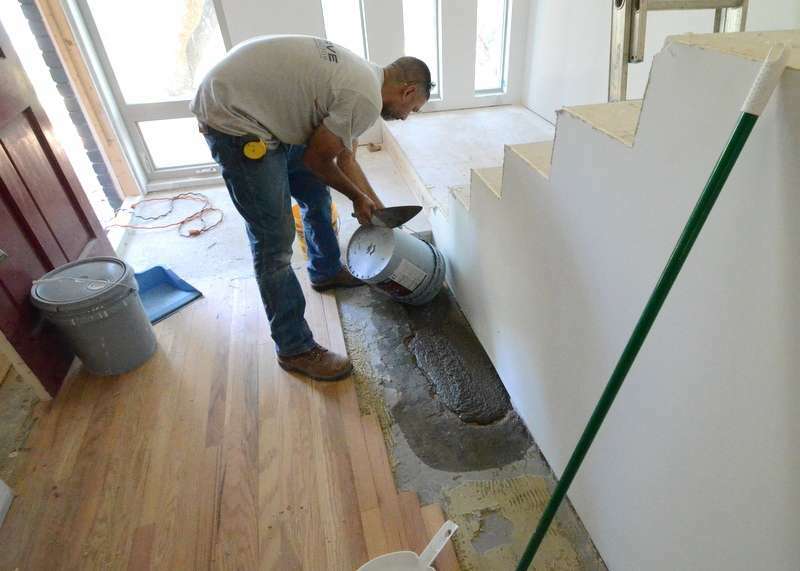 Cris pours concrete to fill the hole in the slab where the original stair treads began. He is standing just about where the original front door opened — clearly illustrating how we have extended the front entry another five feet beyond where Cris is working. We have to bring the slab up level to install the new wood flooring that will replace the existing oak that cannot be saved. Upstairs, the laminate and padding are completely removed, and the loft is vacuumed clean. Hickory planks will be installed here. The exposed subfloor reads as a history lesson — water stains and rusted nails, we think caused by a roof leak; markings on the floor for electrical outlets and a ceiling fan from a remodel; saw cuts at corners where the subfloor was apparently repaired and replaced. During demo, Ranserve opened up the wall at the back of the front entry — and we discovered it was originally open when the house was built, but closed off during an earlier remodel. Today, Steven made another. 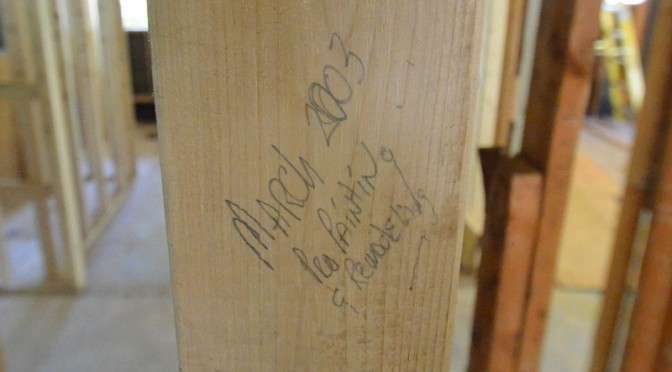 After walking past the lumber framing for weeks, he looked up … and … on the 2×4 used to close off the passage, the remodelers signed their work. Roofing. Ron met with and Steven approved quote from Potter’s Roofing Co. to install sheetmetal and waterproofing at several locations; to remove existing and install new vent flashing in the lower and upper roofs; to patch where mushroom vents and the skylight are removed — and other damaged areas; and to replace the chimney flashing with a new cricket that will move water away from the brick at the back of the chimney where it meets the roof; water flows directly against the brick and existing flashing when it rains. This is wrong. Some of these tasks are built into existing line-item budgets. Some of this work will require change orders. Why the change orders? Ron and the framers opened up the framing behind the chimney and discovered signs of water penetration traveling down the brick. Pocket doors. Ron finalized and Steven approved quote from BMC for interior pocket doors — built into the framing materials line-item in the budget. Exterior doors. Steven also approved second quote from BMC for exterior doors at the kitchen, back door and at at the mudroom into the garage — not including the front door and not including the back door to the garage. The front door is an entirely different task — and Ron is researching whether the back door to the garage must be fire rated. Vanities, medicine cabinets, electrical. Steven delivered dimensional plans for the bathroom vanities, and the medicine cabinets that will be used in bath 2, the mudroom and master bath. This enables Ron and the framers to properly nail lumber into position for the medicine cabinets, which insert into the wall between studs. It also enables Ron, Sean the electrician, and Steven and Jacquela to properly position electrical outlets for the medicine cabinets, which feature built-in LED lighting, and for wall outlets adjacent to the vanities. HVAC. Ron advises that the HVAC rough-in begins Thursday/tomorrow, 23 July. Kitchen cabinets. Also 23 July, Aaron Pratt at Centex Custom Cabinets is scheduled to visit, to begin measuring for the kitchen cabinets. Pending. 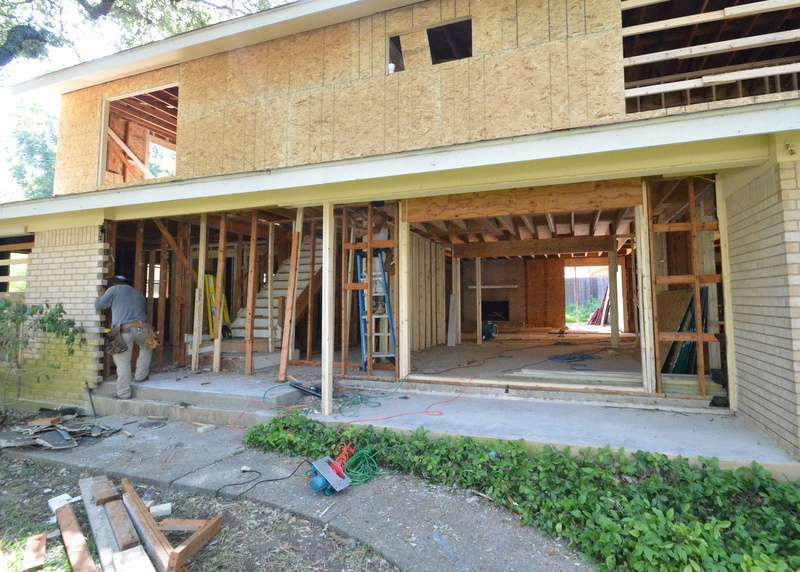 Ron continues to track pending submittals from subcontractors for refinishing the wood floors and laying new wood; how to get electrical power through the slab to the kitchen island; and the candidates for the potential front door. Discovery 1: Structure. Taking out the hearth to the left of and in front of the fireplace reveals the brick may be the only thing holding up the ceiling beams above the fireplace — and we may need to add structural support across the front of the fireplace under the ceiling beams. Ron is researching this with the structural engineer, Ben Feldt at Feldt Consulting Engineers. Discovery 2: Insulation. Ron advises that the sheathing between the brick and studs on the first floor may need additional sealing — every time that demo took out an old cable or fixture, that left a hole in the sheathing. One way to fix this may be to deploy the painters with silicon before we begin insulation. 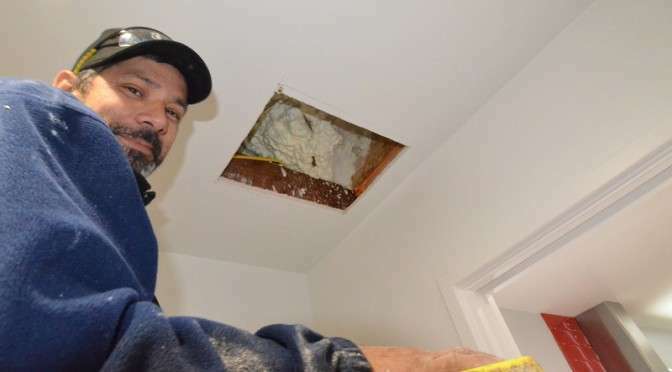 Another approach might be to use expanding foam insulation instead of blown-in insulation. The building plan already calls for foam in the attic, upper and lower roofs, with blown-in insulation in the walls. There’s a cost delta to switch out to foam — should we do this selectively, only where needed, stud bay penetration by stud bay penetration? Or, should we just foam everything? Ron offers to schedule a meeting with the insulation contractor. Steven notes his history with foam — the current house is the first built by John Hagy Homes that is insulated with foam, helping to qualify the house for 3 stars with the Austin Energy Green Building Program — 11 years ago, when foam insulation was new to market. And … the foam yields an airtight house that is much easier to heat and cool, and vastly more efficient. Separately, Steven met with and walked the house with one of the candidate companies to install the structured wiring system — security, low-voltage cables for TV, sound and phone, and the computer network. The stairs are not built to code for rise and tread. 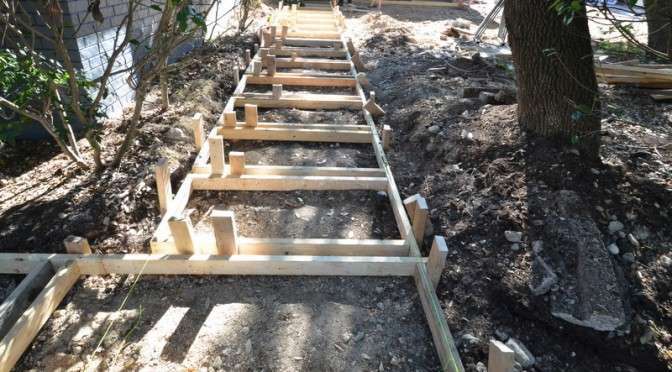 The rise varies from stair to stair — 10 inches for the first stair and landing, then 7.25 inches, until you get to the top, where the rise suddenly shrinks to 5 inches. We suspect the stairs were originally carpeted, built nearly correctly. 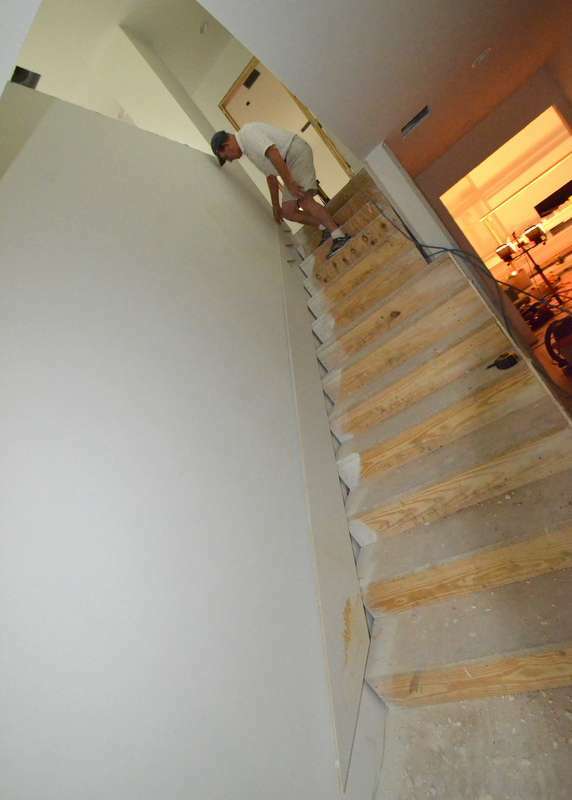 Then a remodel replaced the carpet with oak treads — tripping up ascents and descents. This is the way stairs should be built. All the treads the same depth. All the rises the same height. Proper headroom. Courtesy chestofbooks.com. 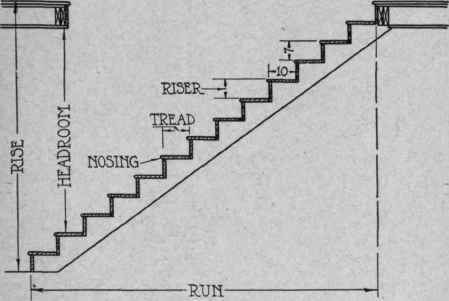 To fix this, we need to add additional run — the horizontal distance the stairs travel from first stair to last. Last week, the framers took out the closet over the stairs at what will be the loft, to ensure we’re not whacking our skulls each time we climb the steps. See photo here. These issues force us to push the front entry of the house forward about 3.5 feet. It’s the only addition to the square footage in the entire remodel. We sweated whether this would complicate or delay permits from the City of Austin, because of limits on impermeable cover. But we’re building the extension over the existing slab, which is already impermeable. And bringing the stairs up to code for safety. The permits came more quickly than we expected. Today, the framers opened up the front wall of the house, and went to work on the structure. By tomorrow, the front door will be repositioned forward 3 feet and turned 90 degrees. A temporary support holds up the front porch. Additional temporary supports hold up the second story as new lumber is cut elsewhere for nailing. Silverio at left, Roberto on the ladder to the left of where the new front windows will soon arrive. "Make it new." Ezra Pound. We wake to a dusting of snow in Austin, TX.